I’m so glad the Gospel includes the disciples. Especially Peter. I had a “Peter” week last week, and what a roller coaster it was! My last post was bold and brave. The next evening, I cried in doubt and insecurity. Where I had been confident of God’s provision, I became anxious. Where I had felt strong, I became insecure. Long after my work-week bedtime, I stayed up crying, frustrated with God and His timing. Long-story, short, our family is struggling financially. My husband has been unemployed for a little over two months and his unemployment funds haven’t been released to him yet. We’ve been relying on what little retirement funds he had to pay bills that were already mounting heavily for us. We have no savings. His retirement is the last of our financial resources, and finding employment suited for my husband has become a challenge. I’ve been trusting God to help us, believing that He will provide. I would love to say I have a steadfast faith, but I don’t yet. Although I’ve found that I’m far more resilient than I have been in the past. So Wednesday I stepped out of the boat in faith. I decided to focus on Jesus and trust in his word to see us through this trial. I wouldn’t focus on my circumstances. My faith was strong, and I wanted to be used mightily by God to encourage other children of God to be strong, too. By Thursday night, I was frustrated and, honestly, a bit angry with God. I had been trusting that not only would our needs be met. I even dared to believe that we might actually experience abundance. Now, I was simply hoping that we would get the unemployment funds that my husband was entitled to. What kind of God withholds what little is owed to us? Where’s the victory in that? How does our lacking provide a testimony to His greatness? Why wasn’t my faithfulness being rewarded? Does God even care? What I love about this passage is not just that Jesus knows that Peter will fail him, but that he knows that Peter will “turn back” and strengthen his brothers. He knows that Peter will repent and return. And He knows that upon his return, Peter will be strong enough in his convictions and faith that he will encourage and strengthen his brothers. After he denies him. He doesn’t count Peter out for failing Him; he counts on Peter’s return. I think our great Intercessor knows that we will fail Him. He knows we’ll step out in faith, only to step back in fear and self-preservation. He also knows that we have the potential to develop resilience and come back to Him stronger. And he never stops loving us. He always welcomes us back with compassion and forgiveness. And, like Peter, I am returning to my blog to encourage you to not give up faith. It is my prayer that each time we fail, we repent and return stronger in our faith. I pray that we allow God to work through our weaknesses and, by the power of the Holy Spirit, empower us to soldier on. 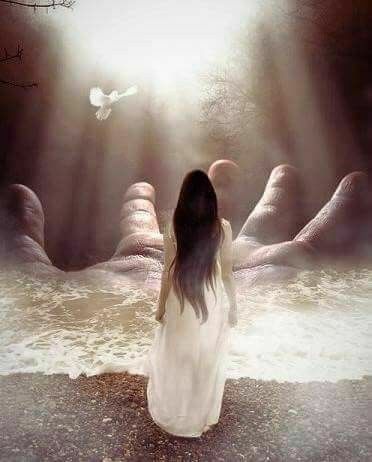 Jesus is there to immediately reach out His hand to catch us. We have only to call out to Him. Previous WHEN YOU’RE ALREADY DISTURBED! this reminds me of the man in the bible who said: I believe; help my unbelief. Pretty much! Been saying that a lot lately. Me too. I think a lot of Christians do.